Fourth Row Center: Film Writings by Jason Bailey: Saturday Night at the Movies: "The Cosby Show"
From November 2008: When The Cosby Show premiered in September of 1984, expectations were low. Star Bill Cosby had starred in hit shows, both major (I Spy) and minor (The Bill Cosby Show), in the 1960s, but his more recent attempts at TV stardom (the 1970s variety programs The New Bill Cosby Show and Cos) had flopped, loudly. The sitcom form itself was on the skids, having fallen hard from the heyday of classics like The Mary Tyler Moore Show and All In The Family to the dreck of Three's Company and The Facts of Life. And it was the Thursday night anchor for NBC, television's lowest-rated network. But by the end of its first season, all of that had changed. 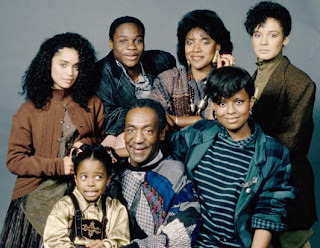 The Cosby Show was the #3-rated show of the year, and would top the Nielsens for the next five consecutive seasons. It lifted NBC (and particularly the network's Thursday night line-up) out of the ratings cellar and into the top spot. And it made Bill Cosby, again, one of the biggest stars in the world. The secrets of its success are simple: the show was honest, truthful, recognizable, and laugh-out-loud funny. The upscale Huxtable family was based on Cosby's real-life brood of four daughters and one son, headed up by Dr. Heathcliff Huxtable (Cosby) and his lawyer wife, Claire (Phylicia Rashad). The series began with four kids in the house: free-spirited Denise (Lisa Bonet), only son Theo (Malcolm-Jamal Warner), know-it-all Vanessa (Tempestt Bledsoe) and precocious Rudy (Keisha Knight Pulliam). Eldest daughter Sondra (Sabrina LeBeauf) was away at Princeton as the series began, but became a regular in its second season; her boyfriend and later husband Elvin (Georffrey Owens) joined soon after. Perhaps it was the characters' close proximity to real people; perhaps it was the skill with which Cosby (himself a doctor of education) was able to mix big laughs with real truth and subtle life lessons. But people identified with the Huxtables. Kids (like me) grew up with them, and wished they had parents like Cliff and Claire; adults identified with the trials and tribulations of the duo and even gleaned some parenting tips, while often striving for a marriage with as much romance (and respect) as theirs. But the serious overtones never got in the way (at least in the early years) of the show's primary focus, which was to entertain. One reason The Cosby Show has aged so well (and so many of its peers haven't) is that the humor was both timeless and explosively funny--even its weakest episode has big laughs. Some of that is due to Cosby's honed and awe-inspiring comic skills (if you don't think this man is funny, I don't know what on earth to say to you), but praise is also due to his stellar supporting cast (particularly Rashad and the limitlessly charismatic Bonet and Warner) and the crew of talented writers. There are set-ups and punch-lines, sure, but they never feel manufactured, and that speaks to the skill of both the scribes who wrote them and the actors that mouthed them. 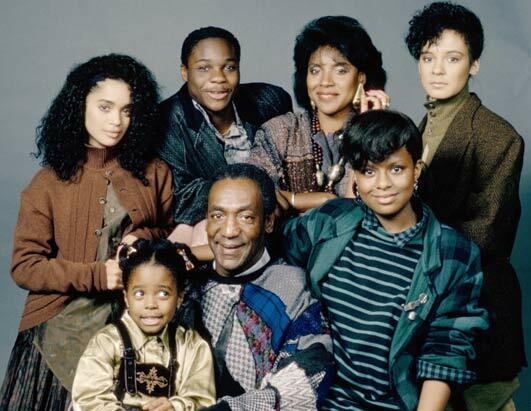 The Cosby Show was originally released, season by season, by Urbanworks Entertainment. That company was subsequently acquired by First Run Studios, who have now collected and re-released the entire series (with a few new perks) in a handsome box as The Cosby Show: 25th Anniversary Commemorative Edition. What is amazing about this show, viewing it in retrospect and from front to back, is how quickly the elements fell into place. Many fine sitcoms took at least several episodes, or sometimes the better part of a season, to find their footing (ever watched the first episode of Friends? Good heavens). But The Cosby Show is coming on strong from the beginning of Season One. The "Pilot" episode doesn't even have the sets right yet, but it has one of the most famous extended sequences in the series' entire history--Cliff and Theo's conversation about "regular people," as illustrated with a stack of Monopoly money, followed by Theo's heartfelt plea that, in spite of his grades and lack of ambition, his father loves him anyway, "because I'm your son," to which Cliff responds, "That's the dumbest thing I've ever heard in my life!" It's a nice reminder that, while the more raucous family sitcoms of the late 80s (like Married With Children and Roseanne) marked themselves as the "anti-Cosbys," The Cosby Show was more than a little subversive for its time. Season One is full of classic episodes like that. The second episode, "Goodbye, Mr. Fish," is another all-time classic, as Cliff brings the family together at the toilet bowl to give Rudy's goldfish a proper funeral. In "A Shirt Story," Theo pays Denise to sew him a knock-off of an expensive designer shirt, with hilarious results. "How Ugly Is He?" gives us an opportunity to see Cliff and Claire interact with a jackass potential boyfriend. And in "Independence Day," Theo gets his ear pierced and tries to keep it from Cliff, unsuccessfully. Nearly every episode of the first season is top-notch, with only one real misstep: an episode called "Mr. Quiet," in which the Huxtables spend some time at their local community center. A disproportionate amount of time is spent with the nice folks at the center; come to find out, this episode was intended as a backdoor pilot for a spin-off series that (unsurprisingly) never got off the ground. The big news about the first season's inclusion in this set is the rectification of a major flaw in the original discs. When this season was first released in summer of 2005, it was greeted with howls of derision from all corners (including ours), because Urbanworks made the inexplicable decision to use the edited, syndication-ready versions of these episodes--each running a good two to three minutes shorter than in their original network airings. The lesson was learned after that first release, and seasons two through eight contained the uncut episodes. Now, thankfully, First Look has included the original network versions of the first season episodes, and the set is better for it. Season Two finds the cast fully at ease, with chemistry in top form, scripts consistently funny, and all episodes well-directed by sitcom vet Jay Sandrich. This was also the first season to use the "dancing introductions" for the opening credits, in which Cosby and the cast get down to ever-changing interpretations of the show's theme song. This season may be the series' strongest, with a marvelous assortment of memorable episodes. First of all, it includes this reviewer's all-time favorite show, "Happy Anniversary," in which the family celebrates the 49th anniversary of Cliff's parents with a dinner, some gifts, and some entertainment: a lip-sych and dance performance of Ray Charles' "Night Time Is The Right Time." The "Cliff In Love" episode features the first appearance of Owens as Elvin, whose slightly sexist attitudes give Claire some of her finest moments. The "Denise Drives" episode gives Cosby some of his biggest laughs of the season, especially in his description of the car that Denise wants to buy. But the "Denise's Friend" episode spotlights this show doing what it does best, as an encounter with the title character causes Cliff and Claire to call a family meeting that is smart, funny, and genuinely touching. In entering Season Three, Cosby and his crew clearly realized that if it ain't broke, don't fix it. Bonet's spin-off, A Different World, had not yet hit the air, so she is still a regular on the show, though seen more sporadically. Rashad was pregnant, but her pregnancy was not worked into the show, so she spends a lot of the season hiding behind counters, grocery bags, boxes, and even a giant teddy bear. Owens returns in two of the season's best episodes: "Monster Man Huxtable," in which he helps Theo with his wrestling moves, and "I Know That You Know," where the family uses Elvin and Sondra's engagement as an opportunity to pull a fast one on Cliff. The show starts to lose a little bit of its bearings in Season Four. Don't get me wrong, there's still some very funny shows here--"Call of the Wild," for example, in which Sondra and Elvin announce that they've changed their career plans, or "It's Not Easy Being Green," featuring Cliff's attempts to get rid of an old water heater. But we also have the inevitable (and always dreaded) "clip show," "Looking Back" (a two-partner, no less); the rather plodding "Shakespeare" episode; and "Once Upon A Time," a dress-up-in-funny-costumes fairy-tale episode that doesn't work at all. There are great moments to be found in an episode like "The Prom," but also too much time spent with Theo and his friends (including a young, scrawny Adam Sandler), in an apparent attempt to engage with and relate to younger viewers. The lesson of this episode, and much of the rest of the series, is that the show does its best stuff when it stays close to home, and when it gives Cosby and Rashad plenty to do. That said, there are still plenty of gems to be found in the fourth season. Season Five is about on par with its immediate predecessor--again, a few episodes strike out, but there are a number of fine and funny shows here, as Sondra and Elvin start their own family, Theo has some girl troubles, and Lisa Bonet (already gone from her own spin-off due to a pregnancy) makes a handful of appearances before heading off for an extended trip to Africa. Theo's friends again have a little too much airtime this season, but Warner's continuing growth as a comic actor makes these detours a little more enjoyable. The series does hit a weak patch by the time we get to Season Six. Bonet makes a welcome return to series regular status this year, bringing back a new husband (Joseph C. Phillips, likeable if a bit of a cipher) and stepdaughter Olivia (Raven-Symone). Symone's addition to the series is the first sign of a possible shark-jumping; the writers, producers, or network apparently felt that Rudy was getting too old for the precocious kid stuff, and with the older Huxtable kids aging as well, some new blood was apparently called for. The tiny actress is cute enough, but she becomes a problem--she is given the kind of "too wise for her age", smart-kid dialogue that was expertly avoided during Rudy's younger years. There are still occasional great episodes--"Cliff's Wet Adventure," for example, which gives Cosby some of his biggest laughs of the season, or Theo's wail for his lost love Justine in "Not Everybody Loves the Blues"--but there are also two unfortunate and entirely unsuccessful dips into surrealism ("The Day The Spores Landed" and "Cliff's Nightmare") that are so far out of tone and sync with the series that the feel air-lifted in from another, lesser series. Some consider little Olivia to be the "cousin Oliver" of The Cosby Show, but as annoying and too-cutesy as she can be, my vote goes to "cousin Pam," (Erika Alexander) who joined the cast a few episodes into Season Seven. Her first episode ("Period of Adjustment") aired just a few weeks after the premiere of The Fresh Prince of Bel-Air, but her entire character feels like a knock-off of that show--inner city teen moves in with the rich relatives, culture clashes ensue. By this point in the series, all of the Huxtable kids save for Rudy have left the house for college or families, so the addition of cousin Pam is partially understandable, but it doesn't mean her storylines work; we're asked to immediately devote our attention to a peripheral, previously-unmentioned character who is often prone to making trouble and challenging Cliff and Claire, who conversely seem preachier and pushier than in previous seasons, thanks in part to the less-nimble writing of some of the more serious moments. Again, there's still some good stuff here, but Pam is ultimately an unsuccessful distraction (and if you'd like proof, note that in the combined 2 1/2 hours of making-of documentaries, Pam is not seen or mentioned once). Ratings took a bit of a dip in season seven, so Cosby and the crew decided to fold up shop while they were ahead and announced that Season Eight would be their last. The overall quality is up a bit from the previous year; there's still way more of cousin Pam than we want or need, but Vanessa gets an entertaining story-arc (she gets engaged to a much older maintenance man), Theo gets plenty of screen time, and the series goes out with a very classy two-part finale, "And So We Commence," climaxing with Theo's college graduation and a warm and wonderful final scene with Cliff and Claire. The complaints and grievances listed here might undersell the later years of The Cosby Show a bit too much; while its first three seasons were undoubtedly its finest, it was always enjoyable (unlike, say, the last season of Roseanne). Make no mistake: even if you count its later, weaker seasons against it, The Cosby Show is still one of the great TV sitcoms of all time, period, no argument, and it should be in the library of any serious television comedy fan. The weakest, Pam-and-Olivia heavy, late series episode of The Cosby Show is still an episode of The Cosby Show, and there's not one of them that doesn't make this reviewer laugh out loud at least once and smile the rest of the time. What a great show. "The Cosby Show: The Complete Series" is available on DVD; for full A/V and bonus feature details, read this review on DVD Talk. The entire series is also now streaming on Netflix.